Millennials have a serious problem, and it’s not spending all their money on avocado toast: they aren’t taking their paid vacation days. In 2017 alone, American workers forfeited 206 million paid vacation days, which adds up to a hefty chunk of change–$66.4 billion in benefits, to be exact. That means you pretty much donated $604 in work time to your boss. We want to help you get the most out of your paid time off; if you feel as if you can’t possibly leave the office for an entire week, then start with a Friday here and there. And don’t just lie around the house all day, checking emails that can most likely wait until Monday. Get out and explore Virginia! To keep you from making excuses, we’ve done the hard work of planning your next three-day weekend. This month, we traveled to one of the most underrated parts of the state, exploring Bristol, Abingdon, and the epically scenic region of Southwest Virginia. Cash in a vacation day and follow this itinerary for an awesome 72-hour adventure in Virginia. Not sure when to plan this trip? In just a few weeks, Bristol will host Bristol Rhythm & Roots Reunion, a three-day music festival that celebrates Bristol’s heritage as the Birthplace of Country Music. This year’s festival is headlined by Old Crow Medicine Show, but there are dozens of talented bands worth seeing at this incredible annual event. Stay at: The Black Dog Inn or Creeper’s End Lodging in Abingdon, each starting around $115 per night. Hilton Garden Inn in Bristol, starting at $129 per night. Named for the inn’s four-legged resident, Hadley, the Black Dog Inn is a historic restored property in the heart of downtown Abingdon. Featuring beautiful woodwork and antique furnishings, the inn has been renovated with all the modern amenities, including luxurious showers, TVs in every room, and a mini fridge stocked with anything you could possibly want, from sodas and bottled waters to milk and cream options for your morning coffee. Just around the corner, Creeper’s End Lodging consists of two charming cottages that hold seven apartment-style suites. Each room has its own unique layout that caters to every type of guest, from families with small children to solo travelers looking for a quiet spot to unwind at the end of a long day. If you’re looking for comfort, convenience, and affordable accommodations in Bristol, stay at the Hilton Garden Inn, just a few miles from the downtown area. The hotel has everything you expect from a Hilton property, including a fitness center, indoor swimming pool, and an on-site restaurant and bar. COMING SOON: Opening in October 2018, the Bristol Hotel will be the first hotel in downtown Bristol, conveniently situated just off State Street and within walking distance to all the restaurants, shops, and attractions of the city. This historic boutique hotel will offer a rooftop bar, gourmet restaurant, and stunning rooms at affordable rates. Suggested Prior Reservations: Accommodations at Creeper’s End Lodging or Black Dog Inn, bike rentals through Virginia Creeper Trail Bike Shop, tours with Adventure Mendota, dinner at 128 Pecan or Morgan’s. Begin Friday with the drive out to Abingdon and make a quick stop at The Market for lunch. A hidden gem of Southwest Virginia, the restaurant serves a variety of soups, salads, and sandwiches and gets all of its ingredients from local farms and distributors, ensuring that their menu stays fresh and seasonal. Once you’ve finished lunch, your next stop is the Virginia Creeper Trail Bike Shop. The shop rents mountain bikes to riders looking to take on the Virginia Creeper Trail, a 34-mile rail-trail that runs from Whitetop Station inside Mount Rogers National Recreation Area to downtown Abingdon, ending just blocks from the bike shop. The trail is a leisurely downhill ride, but you’ll have the option to choose a shorter bike route if 34 miles seems a bit daunting. We decided on a nine-mile stretch from the shop to Alvarado, which provided a picturesque ride through the rural wooded landscape outside Abingdon. In addition to offering rentals, the bike shop provides a shuttle service, ferrying you and the bikes back to the shop after the ride. Even though the trail is fairly easy, you’ll find yourself in need of a break after hours of biking. Check in to either the Black Dog Inn or Creeper’s End Lodging, both a short distance from Abingdon’s best restaurants and shops, then get ready for your evening out. We started with Wolf Hills Brewing, ordering a flight to get a taste of their excellent brews. The brewery crafts small batches of unique beers, focusing on perfecting the quality of their beers rather than mass-producing large quantities. A few top picks were the Blackberry Gose, Wes’s Wheat, and the Oatmeal Vanilla Porter, a heavenly dessert-like brew that will impress even the light beer drinkers. Abingdon has tons of noteworthy restaurants (fun fact: there are more restaurants per-capita in Abingdon than in San Francisco), so narrowing it down for dinner is no easy task. We recommend dining at either 128 Pecan or Morgan’s. 128 Pecan is casual yet timeless, with a menu featuring upscale southern fare. Start with an appetizer (both the calamari and the parmesan fries were delicious), then choose from entrees like grilled lamb chops, shrimp & grits, and lemon rosemary grilled chicken. If you’re looking for a more formal dining setting, opt for dinner at Morgan’s. The restaurant is known for their hand-cut steaks, served on a large wooden slab with your choice of caramelized onions, roasted garlic & herb butter, sautéed mushrooms, or a Madeira reduction. While the restaurant has an impressive wine list, cocktail lovers shouldn’t miss out on ordering one of their signature drinks, made with fresh herbs, berries, and a selection of syrups and tonics prepared in-house. After dinner, stroll over to the Barter Theatre to catch a show. 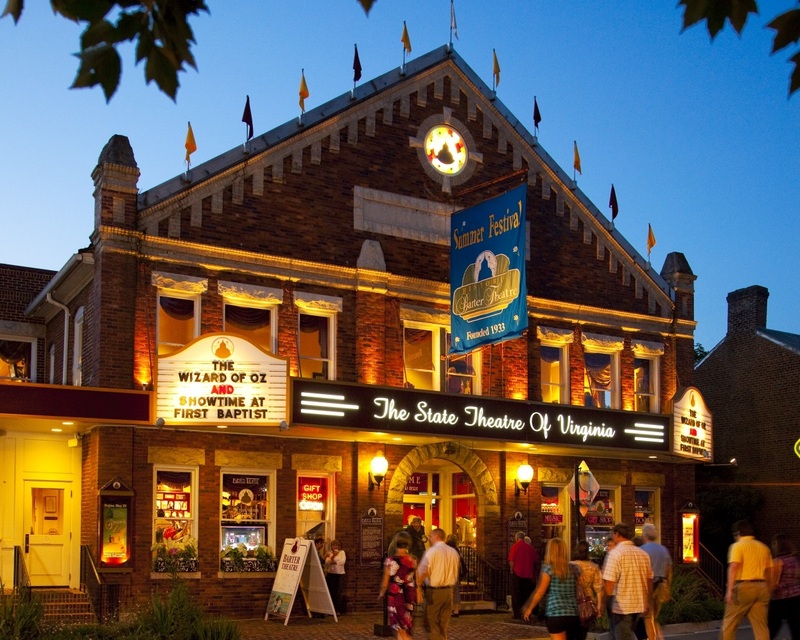 The official state theatre of Virginia, the Barter Theatre has been a staple of the community since 1933. Resident actors team up with special guest stars to put on popular Broadway plays and musicals like Steel Magnolias, Singin’ in the Rain, and Sister Act. Grab a drink after the show at the Martha Hotel, located just across the street from the Barter Theatre. The elegant historic hotel blends old southern charm with modern luxury, and the on-site restaurant and bar is the perfect place to end your first evening in Southwest Virginia. Wake up early on Saturday for breakfast at Blackbird Bakery in Bristol. Pick out breakfast from the glass cases containing an assortment of homemade muffins, donuts, pastries, and other sweet treats. Add a specialty coffee to fully wake up, and grab a seat at the patio tables outside if the weather permits. Hit the road heading west for Adventure Mendota River Outfitters. They’ll get you geared up and ready to explore the North Fork of the Holston River in kayaks. After meeting at the outfitter headquarters, you’ll fill out some paperwork, get a brief instruction seminar, and don your life jackets and water shoes (must be close-toed as the river floor is rocky and rough in some spots) before grabbing the kayaks and hitting the water. After floating a leisurely five miles on the Holston, you’ll exit the river to the waiting Adventure Mendota staff, who will load up the kayaks and equipment before shuttling you back to their shop. If water sports aren’t your first choice, consider hiking at the Channels Natural Area Preserve, a seven-mile round-trip hike to sandstone slot canyons that are approximately 400 million years old. While it’s not a beginner-level trek, the payoff of the massive stone channels at the end is well worth the hike. Head back towards Bristol, where you’ll grab lunch at the Burger Bar. This classic burger joint looks like something straight out of the 1950’s, complete with neon signs, swivel seating at the Formica countertops, and retro pendant lighting overhead. Legend has it that country music star, Hank Williams Sr., ate his last meal at Burger Bar, and in our opinion, that’s a pretty fantastic last meal. Start with one of the juicy burgers with all the toppings and add a side of their chili cheese fries, but save room for a classic milkshake, blended in flavors like Strawberry Shortcake, Marshmallow Crème, and Chocolate Raspberry. Next up, pay a visit to the iconic Birthplace of Country Music Museum, just a short walk from Burger Bar. The museum traces Bristol’s history in country music back to 1927, when the famed Bristol Recording Sessions brought together some of the most important acts in country music, including the Carter Family and Jimmie Rodgers. After learning about these recordings and the effect they had on the music industry as a whole, you’ll see how these songs are still being played by musicians over 90 years later. Spend an hour or so browsing a few of the shops off State Street in Downtown Bristol. Check out the Paramount Theater, a national historic landmark that was built in 1931 and still hosts concerts, movies, and other entertainment on a regular basis. If you’re interested in seeing the interior of the Art Deco-style theater outside of scheduled show times, you can request a tour of the property in advance. Beer lovers have several places to sample in downtown Bristol. Stop into Bristol Station Brews & Taproom for a tasting, followed by a few brews with dinner at nearby Studio Brew. This artisan craft brewery typically has over 15 brews on tap, giving you plenty to choose from. Pair the brews with a wood-fired sandwich or pizza for an incredibly tasty (and filling) dinner. Get a little adventurous with your meal and order the Pizza & Pint of the Day, a “chef’s choice” of pizza matched with your choice of a 16-ounce brew, all for just $10.99. Journey back to the Hilton Garden Inn for a good night’s sleep. Kick-start your last day in Southwest Virginia at White Birch Juice in downtown Abingdon. Besides a handful of healthy breakfast entrees, the restaurant blends up an array of smoothies, cold-pressed juices, and wellness shots using simple, locally sourced ingredients like fresh fruit, spices, and health-conscious produce including wheatgrass and spinach. Try the Scram-bowl, made with your choice of homefries, local grits, or rice & quinoa topped with scrambled egg, mushrooms, spinach, caramelized onions, goat cheese, avocado, red pepper yogurt sauce, and fresh parsley. It’s filling enough to get you through your morning but still light enough that you won’t be tempted to go back to bed. Spend a little more time exploring downtown Abingdon’s shops, then pick up a picnic lunch from Zazzy’s Coffee Roasters. The menu features sandwiches and wraps, salads, a daily selection of quiches, and freshly baked muffins, scones, and turnovers. The restaurant offers to-go lunch combos including a cold sandwich or wrap, a cup of soup, chips, and a cookie or brownie with a bottle of water. Grab your lunch and get back on the road for Grayson Highlands State Park, about an hour east of Abingdon, where you’ll park at the base of the Rhododendron Trail inside Grayson Highlands. If you’re lucky, you’ll spot the resident wild ponies along the trail, as well as some stunning scenery from the top of the short quarter-mile hike. After reaching the top of the trail, you can connect to the Appalachian Trail for a further exploration along the mountains, or head back down the trail to start your trip back home. Follow the Virginia is for Lovers team next month as we “Crush Friday” in Southern Virginia, discovering the small-town charm of destinations like Clarksville, Danville, and Martinsville.